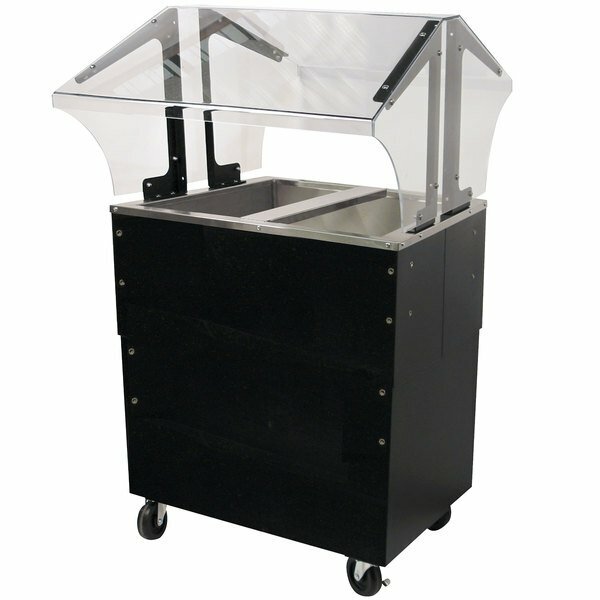 Keep your cold menu items chilled and ready to serve with this stylish Advance Tabco B2-CPU-B-SB two well everyday buffet ice-cooled table. In addition to a two well design, this unit boasts an enclosed base and four 4'' swivel casters, including two with brakes for effortless transport. Assembled with the utmost versatility, convenience, and safety in mind, a double sided thermoplastic polymer sneeze guard and pair of side panels protect the food items on the table from harmful airborne bacteria, making this table ideal for virtually any application. The wells feature 18 gauge stainless steel construction, integrated fiberglass insulation, and are 8'' deep. 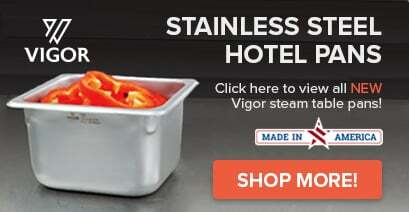 For added durability, the entire unit boasts stainless steel construction that includes an 18 gauge, 304 series stainless steel welded frame and 20 gauge body in a matte black vinyl finish. A 1'' IPS drain is fitted to the bottom of the wells for easy removal of melted ice and water. Adapter bars for 12'' x 20'' food pans are included, and the access panel is removable additional ease-of-use.